Brand New Property. Landscaping and planting yet to mature. 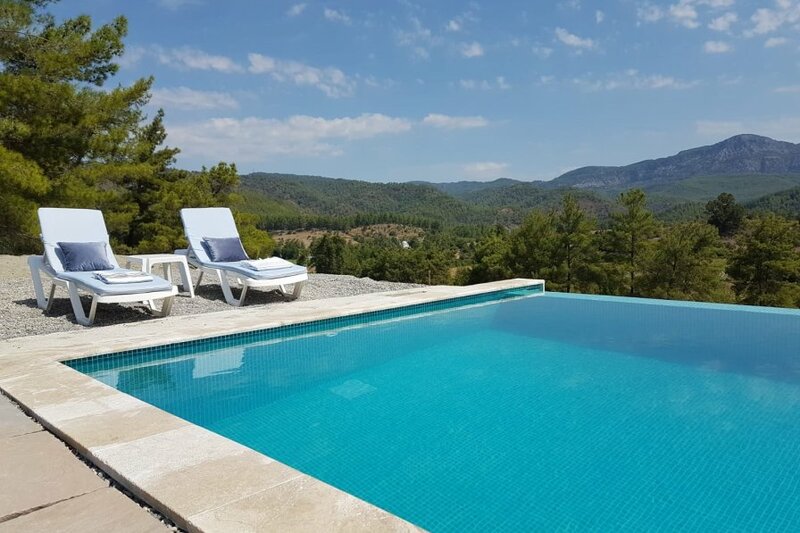 Manzara is a brand new Architect designed villa nestled in the hills between Dalaman and Gocek, the perfect hideaway location from which to explore all that this stunning area has to offer. Furnished to the highet specifications with four En-Suite rooms plus a further Bathroom, an expansive Living/Dining Room opening onto a wrap-around terrace and a large garden boasting an infinity pool with views across the valley. The High-end resort of Gocek with its Marinas, boat charter, Daily Trips, extensive range of good quality shops, bars and restaurants is within 10 minutes drive of your front door and the scrupulously kept, sandy beach and cafe bar at Inlice, just 5 minutes further on the same road. The authentic, bustling Turkish Town of Dalaman is just 10 minutes in the other direction, where the market on a Thursday is not to be missed. Other attractions and days out in the area include The Rock tombs of Fethiye, the ancient city of Tlos, The Ghost village of Kaya Koyu and the stunning Saklikent Gorge. if you seek tranquility, and to be immersed in nature but with the bonus of being just 10 minutes from all the usual attractions of a holiday destination then Manzara is waiting for you. The property managers live locally and will be on hand to help you with all your needs during your stay. The Owner is available by email at all times.